The Art of the Book is part of the history of Venice, and the Scuola Internazionale di Graficais the ideal place to continue this tradition within the world of contemporary art with a program dedicated to artists working in book form. Venice offers the patrimony of the ‘Biblioteca Marciana’, one of the first libraries (constructed in 1537), which now has a collection of around one million items. The city is also the place where Aldus Manutius founded the Aldine Press; an innovative publisher of his age, his small portable books, (enchiridia), revolutionised personal reading, and today are considered to be the predecessor of the modern paperback. Within this incredible historical background, the Artists’ Book Course at the Scuola Internazionale di Grafica (first structured in 1983 by French artist Bertrand Dorny), has now been running for over thirty years. The experience is today enriched by prominent invited guest artists who offer strength to a course which combines different media to make unique works or limited editions with text and image: artists such as Sioban Piercy from Ireland (currently guest artist in residence). Previous guest artists include Maria Lai (Italy), Uta Schneider and Ulrike Stoltz (Germany), Lena Bergstein (Brazil), John Ross (USA), Helen Douglas (Scotland) and Peter Koch (USA). Sioban Piercy (Ireland) currently guest artist in residence at Scuola Internazionale di Grafica. The Scuola also has an important collection of artists’ books, a testament to over fifty years of activity. Vast in both variety and impact, approximately 400 books in total offer a resource of unique vision and inspiration for the artists’ books course participants. The book collection includes donations from Italian and International artists, including: John Ross (USA), Bertrand Dorny (France), Maria Lai (Italy), Gerd Winner (Germany), Keith Achepohl (USA), Carrie Galbraith (USA), Amy Worthen (USA) , Helen Douglas (Scotland), Meri Gorni (Italy), Mandy Bonnell (UK) and Rainer Mordmuller & Claudio Ambrosini (Germany & Italy) . The program is further enriched by exhibitions featuring bookworks at the Scuola Internazionale di Grafica’s ‘SG gallery’, a venue which is currently showing The 8th International Artist’s Book Triennial, Vilnius 2018: ‘MEMENTO MORI’. This is the third occasion that SG gallery has hosted the Triennial. In 1997, Kestutis Vasiliunas, artist and project curator, had the inspired idea for a truly International exhibition and travelling event. 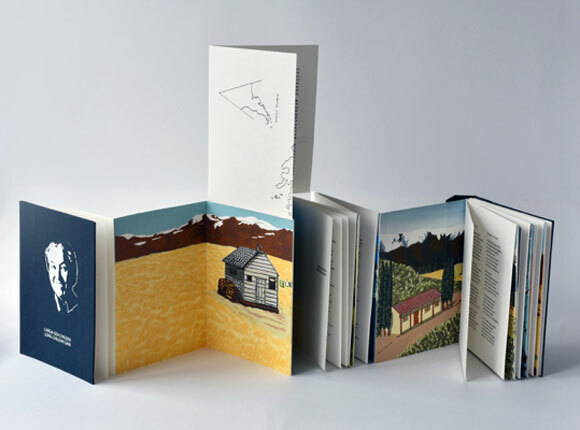 Over the period of twenty years, the Triennial has now included 1,610 artists from ninety-three countries who have submitted more than 3,000 artists’ books. In its 8th edition and still attracting an unprecedented number of submissions from around the world, the touring exhibition began at The Martynas Mazvydas National Library of Lithuania in Vilnius, was subsequently shown at the Leipzig Book Fair in Germany, and after several locations in Italy, will then travel to the USA. 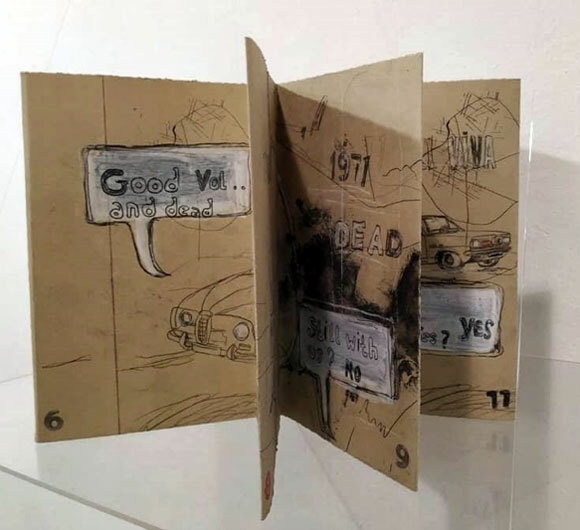 Organised by Circle Bokartas, and sponsored by the Lithuanian Council for Culture, The International Triennial of Artists’ Books, Vilnius continues until 13 April 2019. Frances Breen (Austria), Diane Britt (USA), András Butak (Hungary), Loretta Cappanera (Italy), Yuko Ebina (Japan), Magdalena Cordero Echeverria (Chile), Roberta Feoli (Italy), Roberto Gianinetti (Italy), Kristín Guðbrandsdóttir (Iceland), Nancy Hart (USA), Susanne Helweg (Denmar), Déirdre Kelly (Ireland), Koichi Kiyono (Japan), Marianne Laimer (Sweden), Silvia Lepore (Italy), Stephen Mumberson (UK), Katriona Persson (Sweden), Margit Pflügl (Austria), Miglė Pužaitė (Lithuania), Anna Snædís Sigmarsdóttir (Iceland), Motoko Tachikawa (Japan), Peter & Donna Thomas (USA) Celestina Vičevič (Croatia), and Carola Willbrand (Germany).